This thing happens in the DIY blogosphere. Someone gets up on YouTube and gives a tutorial on how to clean out the sediment from your water heater. You've read a bunch of articles online, on reputable-looking websites, telling you that you must drain your water heater to flush out the sediment. 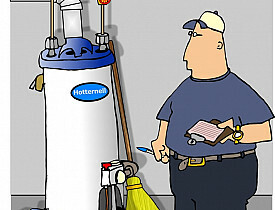 They don't mention one important caveat, though: It's a very good idea to remove sediment from your tank water heater, but if you haven't done it in years, flushing your water heater may cause problems you never imagined. This is what can happen to your hot water heater if it's been collecting sediment for years, and you suddenly drain it: the water heater will spring a leak. According to Woodbridge Environmental, a contractor and home inspector, "In some towns where they flush their fire hydrants to keep the pipes clear, it is suggested to follow their lead a few days after, as any sediment that is disturbed ends up on the bottom of your heater. "What happens then is water displacement. The sandy (particles) that collect on the bottom of the tank displace the water ever so slightly. This results in hot spots on the bottom of the tank. When this occurs the flames overheat the tank and begin to break down the steel. After many years this breakdown ends up becoming a tiny hole that is filled with this debris, oftentimes preventing the leak. "However if you decide to drain your heater after many years of not doing it, or all of a sudden you start using the heater more then normal, this sediment that has been plugging that tiny hole is flushed out, often resulting in a leak in a few days after. "So the moral is to flush yearly, but if you have not done so for many years to not touch it or you will end up with a leak." Two more morals we take from this story: 1) Sorry to shatter your illusions, but you shouldn't listen to everything you read on the Internet and 2) If you need a helping hand with water heater maintenance, call a licensed plumber.